Has discolored teeth affected how you feel about your smile? Do you find yourself covering your mouth when you smile due to stained teeth? If so, a solution is available to that can help remove those unwanted stains and brighten your teeth when you seek out a professional treatment of teeth whitening in Ajax area. An affordable solution to enhancing your smile by simply removing the dull tinge or stains that can make your teeth lose their gleam. By whitening your teeth, it will give you the confidence that you need to happily flash your smile at anyone. A treatment in a dental office costs less than buying various over-the-counter products. A dentist that provides teeth whitening in Ajax does a more thorough job. You do not have to worry about your teeth being different shades. Over-the-counter products use abrasive chemicals that can harm your teeth. You achieve the desired look you want. Your treatment is designed specifically to meet your own personal goal. Professional teeth whitening treatment will last longer than at home products. If you are ready to remove the unwanted stains and discoloration from your teeth, you should consult the professional team at Pickering Square Dental. They offer a range of whitening treatments to help you obtain a stunning smile. From teeth whitening to white fillings, you do not have to worry about tinged teeth affecting your confidence when it comes to smiling at other people. They use the latest technology and products available to help you achieve your overall oral care goal. In a relaxing environment, you will feel at ease the minute you step foot into their office. 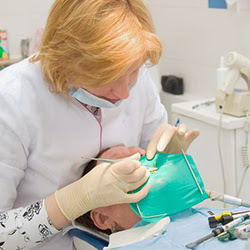 Each dental team member makes it their top priority to make your visit a wonderful experience.